Iwami Ginzan Silver Mine and its Cultural Landscape is a relict mining landscape that flourished between the 17th and 19th centuries due to an exchange of ideas and trade with East Asia and Europe. It gives an overall picture of mine management from silver production to shipment. The entire process was done manually. The mine was developed in 1526 by Kamiya Jutei, a Japanese merchant. Large amounts of quality silver could be produced due to the introduction of the traditional East Asian metal refining method. It reached its peak production of 38 tons in the early 17th century of approximately 38 tons of silver a year which was then a third of world production. Silver production from the mine fell in the nineteenth century as it had trouble competing with mines elsewhere and it was eventually closed in 1923. It’s no miracle that only one of our regulars (hi John!) arrived here before me. The Iwami Ginzan (“ginzan” meaning silver mountain) is located at the northern coast of Honshu, in an area without big cities. The shinkansen takes the route along the south coast, swiftly passing this formerly remote region by. To reach it, I took a regular train from Okayama to Izumo (3 hours), and then it takes another local train (45 minutes) and a local bus (25 minutes) to get at Omori – the village at the heart of this WHS. They are prepared though to receive visitors. The lady at the information office at Odashi station came running out to me at the bus stop to supply me with several glossy brochures in English. One of these included an offer that I had not encountered on my travels before: foreigners get a discount! If you show your passport to proof that you’re not Japanese, you get 100-300 Yen off at each of the major sites to visit in the WHS area. I started my visit at the lower end of Omori town. 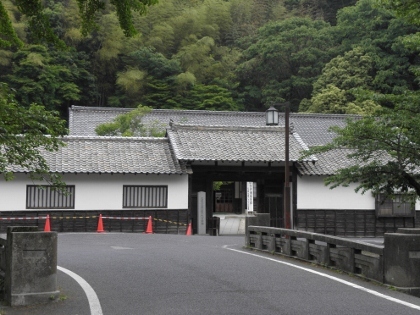 One of the first older buildings here (the Former Magistrate’s Office) holds the Iwami Ginzan Museum. A 20-minute video in English was started for me. It explained Iwami Ginzan’s history, but quite superficial and I did not get more from it than by reading the nomination file during my preparation. The OUV of the site is a bit sketchy, and ICOMOS had recommended a deferral in 2007. But the site got in anyway at the WHC meeting. I walked on further into the valley, through the quiet streets of the town were much of the shops seemed to be closed. Besides mining relics, the site also includes a number of temples and shrines that are related to the mining period. The most impressive surely is the Rakan-ji, a temple built into a cliff where 2 caves hold 250 Buddhist arhat statues each. The remains of the mine are located about 2 km north of the town. It’s a fine walk along the Ginzan Trail, through the forest. Next to the trail lie various remains, such as graves, small mine shafts (600), refineries and workshops. 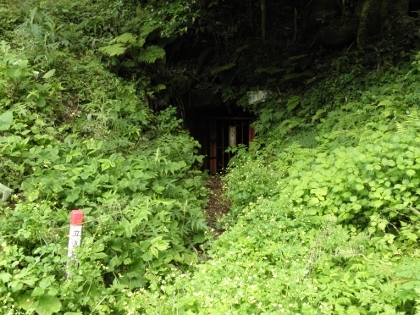 Ryugenju Mabu mine shaft is one of the biggest that has been discovered, and it is open to tourists. You can walk underground for a few hundred meters, not very spectacular I have to say. It shows that this indeed is a very “relict” cultural landscape, mining was already abandoned in the 1920s. My general feeling after visiting this WHS also was that it all was quite “dead” and that it had not come to life for me what had happened here when the silver was mined. Probably the Shimizudani Refinery Ruines were the most memorable part, though these are a very late (1893) addition. 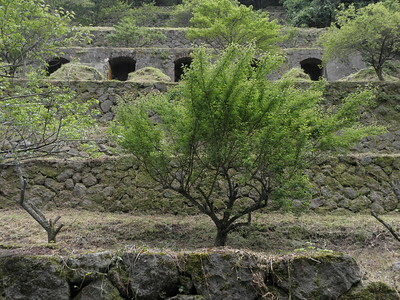 The Iwami Ginzan silver mine was at the heart of a boomtown in the south-west of Honshu Island in the 1600s. But then its fortunes faded and a nearby forest drew in after the mine closed in 1923. By the 1970s, Iwami resembled a ghost town, and might have been forgotten, but for the Yen signs in the eyes of the tourist authorities. In 2007, after intense lobbying in Tokyo, a hole in the ground, of which most Japanese were entirely unaware, joined the ranks of the Taj and the Great Wall of China as a World Heritage Site. So how did Iwami ever make the list? How does any site get "inscribed", to use Unesco-speak? If there is one fatal flaw in the whole process it is that countries submit their own nominations for inclusion. So when local businessman Toshiro Nakamura made it his life's mission to turn Iwami into a tourist attraction, the suits at the local prefecture were all ears. They used their links with diplomats in Tokyo to make a case for Iwami within Unesco's World Heritage Committee. Matsue can also serve as a base to explore the Iwami Ginzan silver mines.It has a beautiful castle and a wide range of accommodation options.Local trains via Izumo to Odashi and from there by shuttle bus every half an hour to Omori, the silver mine town with its beautifully restored old wooden houses, museums and old residences of rich families who made their fortune with the silver trade. 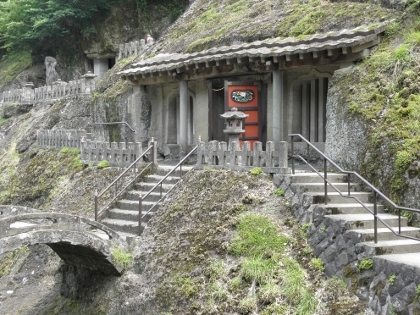 Gohyakurakan cave temple contains about 500 stone statues of Buddhist disciples and is one of the highlights of a a leisurely stroll through the village. Check out the beautiful stone bridges in front of the temple. Much further up is the Ryugenji Mabu shaft from where in the 17th century big quantities of silver was extracted.The shaft can be visited from one side to the other, but even in summer time it can get quite cold.The 5km return walk to the underground tunnel can be done by foot or by renting bicycles. I also visited the Izumo Taisha shrine on my way back to Matsue, its not included in the Unesco list, but definitely worth the detour, since it is one of the oldest shrines in whole of Japan. I found it weird that this site is one of the least visited UNESCO sites in the world, as remote as, say, Ogasawara. But after I came to Hiroshima station tourist information and asked them how to visit Iwami Ginzan, they immediately told me the way. I may confirm Frederic Dawson’s description that this site is easily accessible from Hiroshima for one day trip. The buses (as of April 2013) run from Hiroshima train station at 10:00 (12:40 at Iwami) and 14:55 (17:35), where buses back from Iwami are at 7:52 and 16:22. Although I found the bus price a bit too high (6000 JPY for roundtrip), Iwami Ginzan is definitely worth visiting. I started my visit from World Heritage Center (the only place where foreigners are handicapped in ticket price), where I was provided with tablet explaining the exhibition in English. This is a good start to understand the history of the place and familiarize with miners’ day life. Then we moved by local bus to Omori town to see Ryugenji Mabu Mine Shaft, the main mine shaft in the area. I was surprised that the mine shaft could be easily visited even with baby-stroller (I travelled there with my wife and infant son). Then we moved back to Omori walking in picturesque landscape between traditional Japanese houses. In Omori I strongly recommend visiting Rakan-Ji Temple with hundreds small Buddha monuments (each one different). Although we were the only non-Japanese tourists that day, there were lots of Japanese excursions there. Maybe this is the best recommendation that Iwami Ginzan is worth visiting. Tip: if you want to visit the site in one-day trip from Hiroshima, you have only 3.5 hours in Omori. The best way to visit the site in this short time is renting a bike, available near the bus stop. Japan is one of my favorite destinations, after a great personal winter tour to Northern Japan early this year; I never imagined that I will have a business trip to this country again in the same year, and with no hesitation I immediately planned to visit Iwami Ginzan, the only World Heritage Site on Honshu Island that I have not seen yet. Reading Els’s and John Booth’s review, Iwami Ginzan seems to be very hard to visit and quite complicated for means of transportation, but actually the place is very easy to go. Iwami Ginzan is one of the few tourist attractions in Japan, that tourists need to look for alternative transportation instead of its superb train system, and the answer for Iwami Ginzan is the reliable and comfortable long distance bus. From Hiroshima Train Station, there are direct buses connecting the city to the village of Omori and Iwami Ginzan World Heritage Center within 2.5 hours making a possible one day trip! After many beautiful views of countless almost ready to harvest rice fields, my bus finally took me to Omori, the chief village of Iwami Ginzan, the first thing I did was to rent a bike and ride to Raganji Temple to see the cave temples, the caves and the statues inside were quite nice to see, then I continue my trip to Ryugenji Mabu Shaft, the sample silver mine that open for casual tourists. The mine was really cold inside even I visited in the summer with more than 30 Celsius outside! The mine hole actually really small, hard to believe the hardship of miners in old time, even today the mine has been expanded for tourist, I still considered it to be very small! After mine, I ride my bicycle back to the village to discovered many beautiful wooden houses. Omori was quite photogenic with row of traditional houses, and I really enjoyed walking around the place. While most of the shops seemed to be closed, but actually business is opened as usual, just moved the sliding door to enter inside. My favorite place in the village was the Kumagai Residence Museum; the residence displayed the lifestyle of rich merchant class. I really impressed its lovely Japanese garden, tea ceremony room and big kitchen. Then I took a local bus to World Heritage Center to see the exhibition of Iwami Ginzan history before took a bus back to Hiroshima. All in all Iwami Ginzan is a fine World Heritage Site, but mining is not my interest so I don’t feel any special from the site except the fact that of how small of original mines is. For the village of Omori, I really liked the place as it still able to keep rural and peaceful atmosphere, the place is still not in the full show of commercialization liked other Japanese tourist spots. The town itself seems to know the important of restricted development, many modernity are kept well behind even the vending machines are put inside wooden cases. But everything can change in the future as well as Iwami Ginzan that from sleepy village to prosperous mining town then from prosperous mining town to unknown village and currently from unknown village to the World Heritage Site! To reach the main part of the Iwami Ginza silver mine I took a bus to Omori Ginzan from Odashi station. 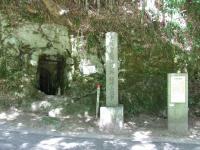 The walk up to the Ryugenji shaft was interspersed with interesing buildings related to the operation of the mine. The Ryugenji shaft has been enlarged and illuminated to accommodate visitors, but what amazed me were the other shafts visible in the bush, but closed off with steel barriers. These were tiny by comparison, and the miners had to crawl through these with candles for illumination, and chip away at the silver ore.
Another part of this WHS that I visited was Yunotsu, a port from which the silver was exported to Korea and other parts of the world. Today it is a sleepy fishing village, and still contains many old wooden houses, inns and commercial buildings. It is just a short walk from Yunotsu station. Breweries: Wakabayashi Brewery in Yunotsu, part of Iwami Ginzan was established in 1869. Its specialty is a sake they call Kaishun. Religious sites connected to fishermen: Ebisu Shrines at Okidomari and Tomogaura (part of Iwami Ginzan) are dedicated to Ebisu, Shinto God of fishermen.